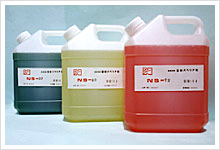 NS Chemical Products | Nihon Superior Co., Ltd. The NS-316 no-clean flux series was developed to eliminate the need for washing after the application of the solder. It is a non-halide post flux for printed circuit boards. The NS-316 series was developed to compensate for the shortcomings of conventional low residual dross type flux and it is compatible with spray-type fluxer. Bearing in mind the restrictions on CFC use, NS-316 really is your best solution for no-clean flux. The formation and manifestation of balling, bridging and icicles that are the downfall of so many solders is not a feature of the NS-316 series. It is possible for boards to undergo checking after soldering without a preliminary wash. The solder does not interfere with the electrical contacts contained in connectors or switches. There is very little flux residue deposited onto the circuit board. Reduced maintenance costs are a benefit of using NS-316 as youﾁll find that the flux leaves very little dirt or wear and tear on machinery. NS-334 is an alcohol-based no-clean solder flux. As the flux does not contain halogen, the ratio of solid content is low, which translates into very little residual dross. Moreover, as NS-334 does not contain any water, there is no dispersion whatsoever. Soldering with NS-334 leaves a brilliant varnish-like hue. Can be used as a dip, spray or foam. Ideal for use with single-sided or double sided circuit boards (with or without solder coating). Perfect for tinning and coating covered or stranded wires and for solder coating printed circuit boards. Does not contain any rosin or resin. 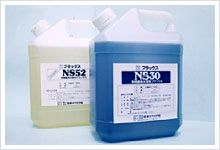 Using NS-334 can have a positive impact on your cleaning machinery, solvent and staffing costs. *l Will be displayed in another window. When using MS-316 and/or NS-334 please be sure to control the concentration of the flux. Ideal for coating/printing, RM-5 is a highly reliable RMA-type smooth flux. Our non-halide organic acid type water soluble flux, designed for those applications where use of halogen must be avoided, is suitable for all sorts of applications such as electronic components, semi-conductors and the solder plating of printed circuit boards. This non-halide series offers the same high performance when used with metals such as copper, 42 alloy and nickel as conventional halogen-based flux. This is a highly active flux. The flux residue does have a slight corrosive effect, but said residue can be simply removed by rinsing with water.